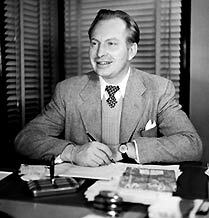 The story of L. Ron Hubbard’s system of management begins on May 9, 1950, when L. Ron Hubbard released his monumental and definitive work on the human mind, Dianetics: The Modern Science of Mental Health. In addition to everything it represented in terms of happiness, newfound potentials and eventual spiritual freedom for man, with its release, the seeds were sown for the development of the first uniformly workable system of management and organization. Almost overnight Dianetics became a nationwide bestseller, remaining on the New York Times bestseller list for 28 consecutive weeks. By June, the first Hubbard Dianetics Research Foundation was established in Elizabeth, New Jersey with branch offices soon following in New York, Chicago, Washington D.C., Los Angeles and Hawaii. By late fall of that year, more than 750 Dianetics groups had spread across the nation. By fall of the following year, Mr. Hubbard’s research had led him into the realm of the human spirit and Scientology was born. Given the inherently spiritual nature of Mr. Hubbard’s research it was not surprising that Mr Hubbard’s readers and pupils saw themselves as students of a new religion. Thus, in 1954, the first Church of Scientology was established. Today, Scientology churches span every continent and Scientologists number in the millions. The point, however, was that with such constant and widespread growth, a uniformly workable system of organization became vital if Mr. Hubbard was to satisfy the demand for Dianetics and Scientology lectures, training, delivery, guidance, publications and distribution. And such a system would have to be applicable to organizations, large and small, in nations, from Great Britain to New Zealand and from South Africa to Finland. Developing, piloting, fine-tuning and codifying procedures, Mr. Hubbard began issuing the results of his research as administrative policies to Scientology organization staff around the world. Moving to Saint Hill Manor in the southern English county of Sussex in the early 1960s, he immersed himself into his most intensive period of organizational and administrative research. 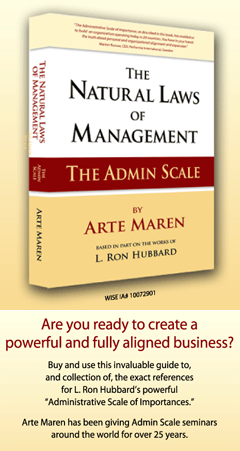 He developed the renowned seven-division organizing board, a breakthrough which expresses every basic function and the overall form needed to run and develop any organization. With the organizational form in place, he then issued policy after policy on each of the functions and duties laid out in this organizing board. In 1965 alone, from his office at Saint Hill Manor, he penned more than 300 administrative policy letters. As these were issued, the staff of Scientology churches began applying them and soon Scientologists congregating for services at their local churches saw first-hand the results and began applying these same policies to their own activities with similar results. 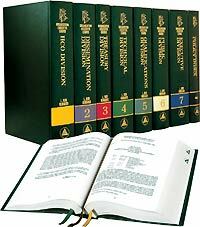 All of these policies, more than 2500 of them, were issued in the encyclopedic volumes of the Organization Executive Course and the Management Series set, making them broadly available to both Church staff and public Scientologists.